COLORADO SPRINGS — A woman’s 83-foot jump off of Guffey Gorge in Florissant this summer, which ended in a painful belly flop, is a perfect example of why Colorado Springs’ air ambulance services are so busy. Traditionally, the services have rushed trauma patients from emergency scenes, such as car crashes, and shuttled patients between hospitals when a higher level of care is critical. Now, a growing portion of the air ambulance business is rescuing adventure-seeking, daredevil residents and visitors. The jumper, for example, was visiting the popular swimming hole — also known as Paradise Cove — over the Fourth of July holiday weekend when she took the plunge. Multiple signs warn against dives, but they’re easy to ignore when so many others test the odds and win. The woman wasn’t as lucky; video of the jump showed her flailing in the air before smacking the water. She suffered a bloody nose and was “highly disoriented.” To be safe, she was airlifted to a nearby hospital. “I think the record is transporting two or three patients in the same day from people jumping off (Guffey Gorge),” said Flight for Life Colorado nurse Megan Hawbaker, who is stationed at St. Francis Medical Center. The state attracts nearly 80 million visitors a year, Colorado tourism officials say, but the rugged terrain and unpredictable weather creates dangers that few are prepared for as they trek into the backcountry or get caught up in “the phenomenon of bagging a fourteener,” Flight for Life program director Kathleen Mayer said. Even The Incline, Manitou’s torturous stair-stepper, has become “a huge search and rescue burden,” as tourists try to take on more of Colorado than they’re physically able to handle, Hawbaker added. “It’s gone up,” Mayer said of Flight for Life’s volume, which rose 12 percent in the first three months of the 2017 fiscal year, which ended in June, compared to the previous year. In total, the service assisted 6,300 patients in the 2017 fiscal year, she said, nearly half of them by helicopter; the rest were taken by ground and fixed-wing transport. 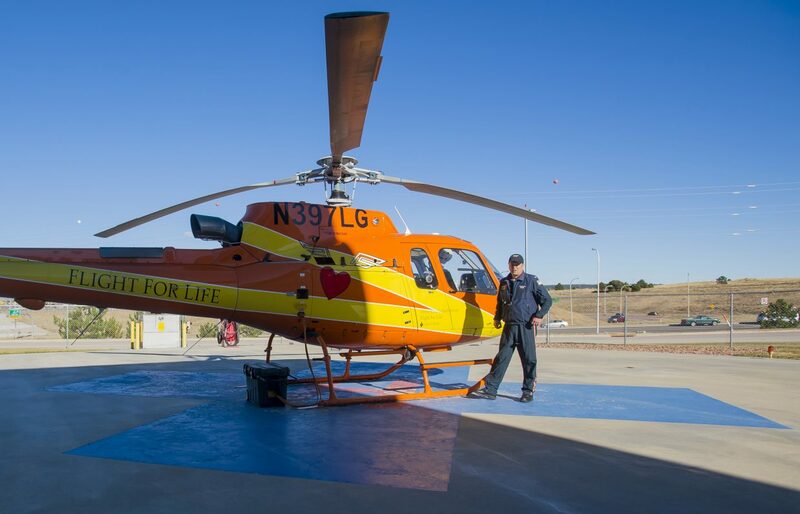 Make no mistake, the lion’s share of Flight for Life services caters to inter-facility transports and medical emergencies in communities out east, which are supported by volunteer fire departments and are 45 minutes to an hour from the nearest hospital. The same holds true with Memorial Star Emergency Medical Transport, which operates at Memorial Hospital, though program director Mardean Haines declined to provide its flight stats. Because Flight for Life assists El Paso County Search and Rescue and ski patrols, its crews see firsthand how much trauma is infiltrating the state. Pilot Shawn McFarland last year received the First Responder Hero Award for his quick thinking on Almagre Mountain, where a mountain biker crashed and severed a femoral artery. Crews have located hunters who radioed in emergencies from their hidden perches, and they frequently search for those reported missing, lost or hurt in Colorado’s wilderness. “We’re willing to go out to just look for people,” medical director Jeremy DeWall said. Thirty of their flights in July and August this year were just that. They also accompany law enforcement during tactical events when the potential for serious injury is high, such as when a possible live mortar round was found in Woodland Park this summer, forcing 50 people to evacuate their homes. Yes, even if the injury was the result of an illicit dive off of an 83-foot cliff. “It’s here for the community,” DeWall said.